My mother and I were spending a lovely day together and when lunchtime came, we found this listing recommended on her Iphone on Yelp. Yes, that’s right. Mom is more technologically hip than I. Well, it came in handy for both of us when it pointed us toward this large, bright, open space with a menu that invited trying new things. I was hoping to find a current menu on their website so that I could give more precise descriptions of these unusual ingredients, but it looks to be an outdated version. I will do the best I can. The business lunch is a fair price for an upscale, 4 star restaurant and it included three courses. 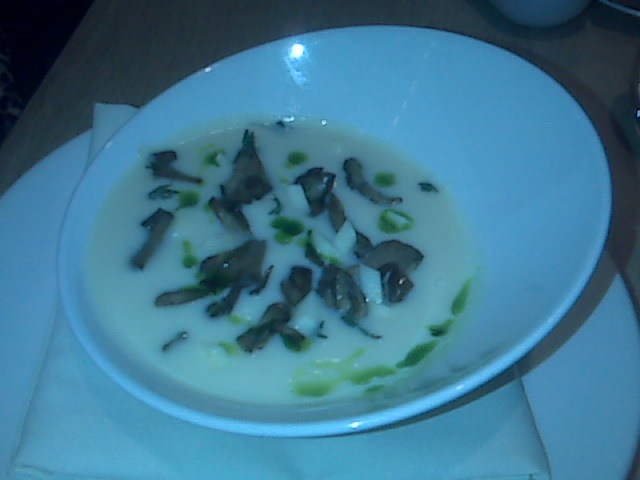 I started with a soup made from parsnip, mushrooms, (I think they were chanterelles but I’m not sure) thyme, (which added a warm, earthy undertone that I loved and initially mistook for rosemary) and honeycrisp apples. It was really excellent. Creamy- but not too rich and filling. Each flavor stood on it’s own but complemented the others. The presentation was lovely, in a whimsical, lopsided bowl. My mother had the autumn squash soup which was also superb. The lovely foam on top was anisette flavor- but it was so subtle that it didn’t disturb me at all. Maybe this taste is actually growing on me after many years of loathing it. With our soups we had some grainy rolls and sourdough with a cauliflower and curry spread. My mother really liked the spread, but I only appreciated the consistency of it. The bland flavor wasn’t appealing to me at all, and I couldn’t detect the curry. For my entree I ordered the scallops which came atop a bed of salsilfy that was soaked in red wine (it looked like beets, but had a more crunchy, fibrous texture to it) and some awesome shredded brussels sprouts. The presentation of my entree was so beautiful with crunchy fried strips of yucca (?) on top and a red wine reduction in dots around the plate. 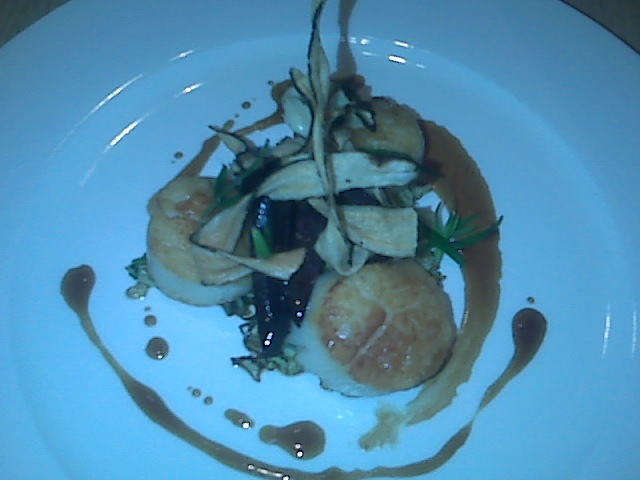 The scallops were super fresh and perfectly seared, but slightly over-salted. For dessert, I had the pumpkin pie with spice cake and pear sorbet. Although it was plated beautifully, my eyes enjoyed eating it more than my palate. The pumpkin part was a wonderful flavor, but no one wants creamy pumpkin jello and it was that springy. The cake underneath was spicy and moist, but I wanted a little sweetness to contrast the savory pumpkin and it was no where to be found. The pear sorbet on the other hand, was fantastic. 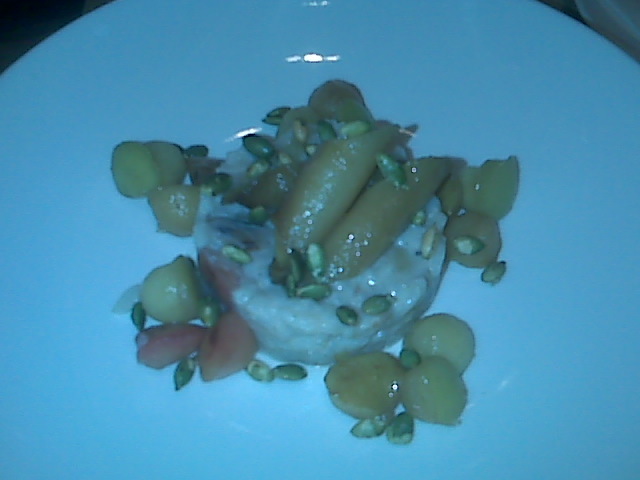 My mother had rice pudding with fruit and an apple cider sauce. Also, not my favorite dessert, but it was creative, pretty and very seasonally appropriate. Overall, there was so much on the menu that I wanted to taste that I would definitely consider going back. I love that they clearly know what is good at the farmer’s market and showcase the best produce they can find. >My friend is the executive chef there and he works closely with a nutritionist in creating the menu. They also do not use any butter or cream in their dishes, so it's diet friendly! >Thanks for the info Risa! Great to know!